Bewdley today, 5164 arrived from Bridgnorth direction, then 7802 from Kidderminster. Half an hour or so later, 7812 arrived on Footplate Experience after the morning round trip and was due out again in the afternoon with another group of participants. D3937 was in use, as wagons were being loaded with ash from alongside the loco siding, and I managed a better shot of “TB2” on the side of the cab. 42968 then arrived from Bridgnorth with the third service train, & we went home. 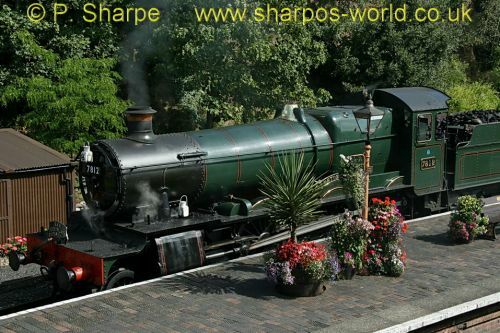 This entry was posted in Severn Valley Railway on September 4, 2009 by Sharpo. Some photos from today. 7812 was on Footplate Experience, the other 3 locos were on service trains. This entry was posted in Sharpo's World Photo Updates on September 4, 2009 by Sharpo.